Totalitarianism – a system of government that is centralized and dictatorial and requires complete subservience to the state. Fascism – a political philosophy, movement, or regime that exalts nation and often race above the individual and that stands for a centralized government headed by a dictatorial leader. Though totalitarian states and fascism can be difficult to comprehend due to their spheres of influence, the movements share some core beliefs and actions. They require citizens to hold basic allegiances, such as to the nation, to national rank, and to a master race or group. The core goal, what expert Robert Paxton defined as fascism’s only definition of morality, is to make the nation stronger, larger, more powerful and successful. Since these parties and groups see national strength as the only thing that makes a nation “good,” the organizations will use any means necessary to achieve that goal. Fascist regimes excel at propaganda and make use of grand gestures, such as parades and leaders’ dramatic entrances. Fascists aim to scapegoat and demonize specific groups. Creating a common enemy is an essential part of the program. That is why the German Nazi regime demonized the Jewish people and others. The primacy of the group. Supporting the group feels more important than maintaining either individual or universal rights. The belief that individualism enables dangerous decadence and has a negative effect on the group. Extreme support of a “natural” leader, who is always male. This results in one man taking on the role of national savior. “The beauty of violence and of will, when they are devoted to the group’s success in a Darwinian struggle,” Paxton wrote. The idea of a naturally superior group or, especially in Hitler’s case, biological racism, fits into a fascist interpretation of Darwinism. Biologist Charles Darwin and Nazi Party leader Adolf Hitler. 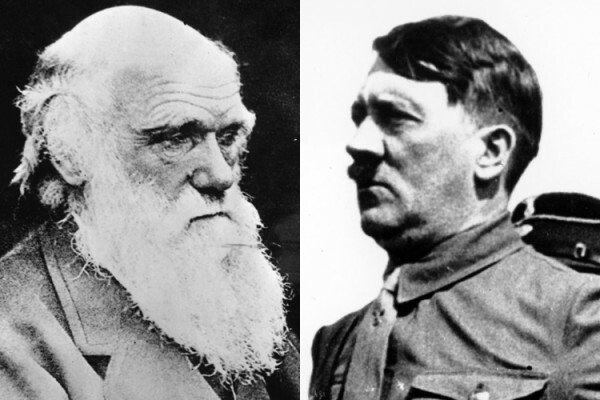 Darwin’s ideas of natural selection inspired Hitler’s racist ideology. Perhaps the largest origin point for fascism was in early 20th-century Italy. The radical Italian writer and nationalist Enrico Corradini was one of the major early influences on the movement. Corradini spoke of the need for a strong nationalist movement, led by elitist aristocrats and anti-democrats who shared a revolutionary commitment to direct action and a willingness to fight. Similar political ideas arose in Germany after the outbreak of World War I. German sociologist Johann Plenge spoke of the rise of a “National Socialism” in Germany within what he termed the “ideas of 1914” that were a declaration of war against the “ideas of 1789” (the French Revolution). According to Plenge, the “ideas of 1789” that included rights of man, democracy, individualism and liberalism were being rejected in favor of “the ideas of 1914” that included “German values” of duty, discipline, law and order. Plenge believed that racial solidarity would replace class division and that “racial comrades” would unite to create a socialist society in the struggle of Germany against Britain. Fascists viewed World War I as bringing revolutionary changes to the world. They saw these changes in the nature of war, society, the state and technology. The advent of total war and mass mobilization had broken down the distinction between civilian and soldier. Civilians had become a critical part in economic production for the war effort, thus creating a “military citizenship” in which all citizens were involved to the military in some manner during the war. Fascists viewed technological developments of weaponry and the state’s total mobilization of its population in the war as symbolizing the beginning of a new era fusing state power with mass politics and technology. 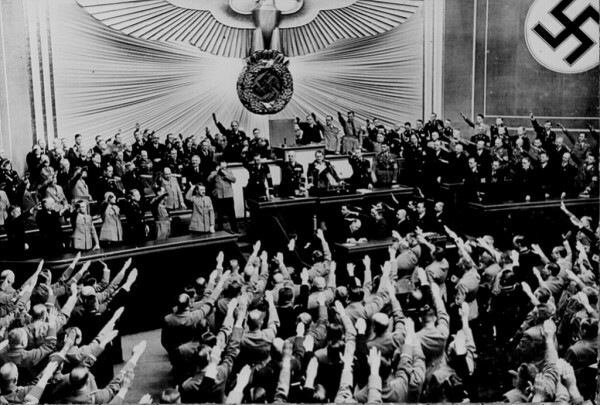 Adolf Hitler receives a standing ovation after giving a speech to the Nazi Party in the Reichstag. The conditions of economic hardship caused by the Great Depression in 1929 brought about an international surge of social unrest. According to historian Philip Morgan, “the onset of the Great Depression…was the greatest stimulus yet to the diffusion and expansion of fascism outside Italy.” In Germany, it contributed to the rise of the National Socialist German Workers Party, which resulted in the demise of the Weimar Republic representative government and the establishment of the fascist Nazi regime under the leadership of Adolf Hitler. With Hitler and the Nazis’ rise to power in 1933, liberal democracy was dissolved in Germany and the Nazis mobilized the country for war. Their goal was to expand German territory and control across Europe. In the 1930s, the Nazis created a common enemy to unite their party by painting Jews and other minority groups as dangerous outsiders. They implemented racial laws that deliberately discriminated against, disenfranchised, and persecuted these groups. Section Objective: Students will gain confidence in their understanding of the rise and fall of fascist powers in 20th-century Europe. When you think of fascism, what groups, nations, and individuals from history come to mind? How have they been portrayed? George Orwell famously wrote that “all art is propaganda,” meaning that everything we read, see, watch or even play has an agenda or intended message (whether we notice it or not!) Working from that idea, what are some examples of propaganda you’ve encountered recently? What were the messages they were trying to convey and how did they do so? comprehend the elements leading to the Holocaust. apply civic virtues and democratic principles to make collaborative decisions. Set Up: Clear space for class to be able to move and physically create in. What is fascism? What is it not? Create a definition as a group. As a class, read through, explore, and discuss Robert Paxton’s seven elements of fascism that serve as mobilizing passions for fascist regimes in the article above. Divide the students into seven groups. Each group is assigned one of Paxton’s seven elements. Groups are given sufficient time to discuss and prepare a series of three short scenes that chart the possible past, present and future, if their assigned element was taken to the extreme. Every member of the group must make an appearance in the performance. Each of the three scenes should be one minute in length, totaling at three minutes of performance per group. Present scenes to the rest of the class. What did you enjoy about the other groups’ scenes? Were the scenes realistic and grounded? Did they escalate to a crazy place? As these scenes progressed, did the future sections feel realistic or as actual possibilities in our reality? Why or why not? compare and contrast historical events, using media, images, or text, to gain understanding of historical, cultural, and political perspectives in history. understand the causes of WWII. describe the major events of WWII, including major battles and the role of new technologies. Supplies: Notecards with historical descriptions on them. Divide the class up into four groups. Each group is given 4 notecards with sentences describing a significant event from the World War I to World War II fascist timeline. No dates should be listed on these cards. Each group gets a random selection of four of these cards. 1910: The right-wing Italian Nationalist Association (ANI) claim that liberal democracy is no longer compatible with the modern world and advocate for a strong state. They believe that humans are naturally predatory and that nations are in a constant struggle in which only the strongest could survive. August 1914: At the outbreak of World War I, the Italian political left becomes severely split over its position on the war. The Italian Socialist Party (PSI) opposes the war but a number of Italian revolutionaries support war against Germany and Austria-Hungary on the grounds that they had to be defeated to ensure the success of socialism. October 1914: Angelo Olivetti forms a pro-interventionist group called the Fascist Party of Revolutionary International Action. Benito Mussolini joins after being expelled from his position as chief editor of a newspaper for his pro-war stance. January 1915 – November 1918: Citizens of the world are conscripted, forcibly enlisted into empirical militaries in WWI. Civilians have become a critical part in economic production for the war effort and thus arose a “military citizenship” in which all citizens supported the military in some manner during the war. Fascists viewed technological developments of weaponry and the state’s total mobilization of its population in the war as symbolizing the beginning of a new era fusing state power with mass politics and technology. October 24, 1922: The Italian Fascist party holds its annual congress in Naples, where Mussolini orders Blackshirts to take control of public buildings and trains and to converge on three points around Rome. October 28 –29,1922: King Victor Emmanuel III of Italy perceived the risk of bloodshed in Rome to be too high in response to attempting to disperse the Fascists. Victor Emmanuel III decided to appoint Mussolini as Prime Minister of Italy and Mussolini arrives in Rome on October 30th to accept the appointment. Fascist propaganda celebrated this event, known as “March on Rome,” as a “seizure” of power because of Fascists’ heroic exploits. November 8 – 9, 1923: The Beer Hall Putsch, a failed coup by the Nazi’s leader Adolf Hitler to seize power in Munich, Bavaria. Approximately two thousand Nazis march to the city center, where they are confronted by the police. Four police officers and sixteen Nazis die in the conflict. Hitler, who is wounded during the clash, escapes immediate arrest and is spirited off to safety in the countryside. After two days, he is arrested and charged with treason. 1925: Mussolini proclaims himself dictator of Italy, assuming full responsibility over the government and announcing the dismissal of parliament. January 30, 1933: With the rise of Hitler and the Nazis to power in 1933, liberal democracy was dissolved in Germany and the Nazis mobilized the country for war, with expansionist territorial aims against several countries. 1930s: The Nazis implement racial laws that deliberately disenfranchise, persecute and discriminate against Jews and other racial and minority groups. September 1, 1939: The invasion of Poland by Germany is deemed unacceptable by Britain, France, and their allies, resulting in the mutual declaration of war against Germany. World War II begins. 1941: The Axis campaign spreads to the Soviet Union after Hitler launches Operation Barbarossa, attempting to invade Soviet territory. At the height of their power, Axis forces control almost all of continental Europe. 1943: After facing multiple military failures, including the Allied invasion of Italy and the international humiliation that follows, Mussolini’s colleagues vote to remove him from his post as the dictator of Italy. He is then arrested on the order of King Victor Emmanuel III. April 28, 1945: Mussolini escapes prison and attempts to flee to Spain but is captured and executed by Italian communist partisans. May 7, 1945: Germany surrenders to the Allies, and the Nazi regime is systematically dismantled by the occupying Allied powers. Victory in Europe (VE) Day is celebrated on May 8. Groups are given 20 minutes to craft 10-second moving scenes that represent each event card (one scene per card.) Each 10-second scene must have a minimum of three lines of dialogue. Every member of the group must be in each of their three scenes. If members of the group are not human characters, they can be scenery, sounds, etc. Teacher should have a master timeline / list with all of the events. At the end of the planning time, students circle up. It’s important to keep the groups separate from other groups (one per corner of the room is our recommendation!) with a WHOLE lot of space in the room. Once groups are in place, the instructors read out the events and the rough dates one at a time. As soon as a group recognizes that the event being read is theirs, they run to the center of the room. Upon completion of reading the event, the instructor counts down (“3-2-1!”) and the students then present their 10-second scene of that event. These should be fast and furious, students run / slide / dive / jump into their positions as quickly as possible to help us physically build this timeline and explore the state of the fascist world in the first half of the 20th century. After completion of the timeline, we recommend sitting down and talking the class through the events they just re-enacted to make sure they understand the overriding arc of the story just told.